Are you considering franchising with a home service business? We’ve got good news. Looks like 2016 is primed to be better than ever for the home improvement market—a perfect time to get in on this booming industry! 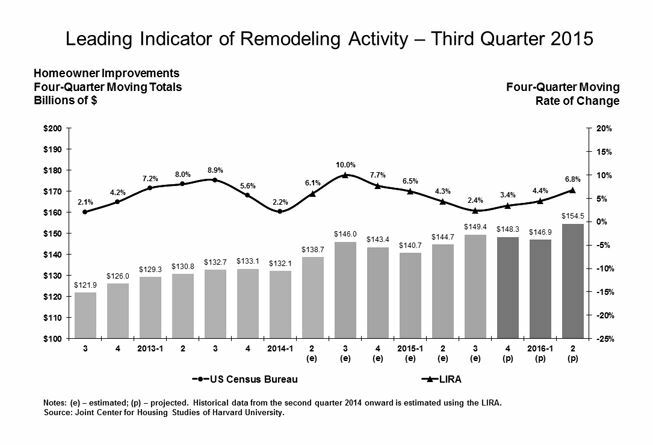 According to LIRA, the Leading Indicator of Remodeling Activity, annual spending growth from the first quarter of 2016 to the third quarter, is expected to grow to more than 7.6%, from 4.3% at the year’s start. This is a trend on track to be the highest since 2006. LIRA is a study released each year by the Joint Center for Housing Studies (JCHS) at Harvard University. Chris Herbert, Managing Director of JCHS, says the report ties directly to the real estate market. According to the JCHS website, LIRA is designed to estimate national homeowner spending on improvements for the current quarter and subsequent three quarters. The indicator, measured as an annual rate-of-change of its components, provides a short-term outlook of homeowner remodeling activity and is intended to help identify future turning points in the business cycle of the home improvement industry. Mr. Rooter is the national leader in plumbing franchises. Strong growth projections in remodeling news mean an increase in service calls for installations and upgrades. Grounds Guys is a full service grounds care company. With new remodeling projects and home additions come adjustments to existing property, or the creation of new residential landscaping. Rainbow International Restoration leads the industry in water, fire and mold restoration. Home construction and remodeling may reveal unwanted discoveries like mold that needs to be removed or air ducts that need cleaning. Five Star Painting specializes in interior and exterior house painting, which undoubtedly includes remodeling projects, whether it is finishing up the final touches with a fresh coat of paint, or making that garage floor shine with a good cleaning and shiny topcoat. Mr. Handyman franchisees are the home improvement professionals. Remodeling is their middle name. An increase in remodeling business means an increase in all things Mr. Handyman. Glass Doctor business owners are the glass replacement and repair professionals. Whether you need new windows, shower doors, mirrors or even custom table tops, Glass Doctor plays a major role in home improvement. Mr. Electric has the power to make things better. An uptick in remodeling projects for homeowners means installation of new outlets, switches and fixtures, as well as safety adjustments and upgrades. Large remodeling budgets may not leave room for brand new appliances in kitchen or laundry areas. Mr. Appliance technicians keep current appliances running smooth and provide the parts needed for efficient operation. Indoor air quality is what makes a home healthy and happy. Heating, Ventilation and Air Conditioning keep newly remodeled homes the perfect climate so homeowners truly enjoy their new space. If you are seeking a business opportunity as a vehicle toward your financial, professional and personal goals, the Dwyer Group family of brands may be for you. Click on the above brand names for more information.